Alastair Hudson’s Equity and Trusts is an ideal textbook for undergraduate courses on the law of trusts and equitable remedies. It provides a clear, current and comprehensive account of the subject. The author’s enthusiasm and expertise shine through, helping to bring to life an area of the law which students often find challenging. This Ninth Edition has been extensively re-written but remains the same book in spirit as it has always been. It contains an analysis of the important decisions of the Supreme Court in FHR European Ventures v Cedar Capital, Jones v Kernott, and Williams v Central Bank of Nigeria, and the important decisions in Charity Commission v Framjee, Rawstron v Freud, Patel v Mirza, Federal Republic of Brazil v Durant, Hodkin, Novoship v Mihaylyuk, National Crime Agency v Robb, St Andrews (Cheam) Lawn Tennis Club, the after-effects of the Lehman Brothers collapse; and analysis of many other new cases besides. 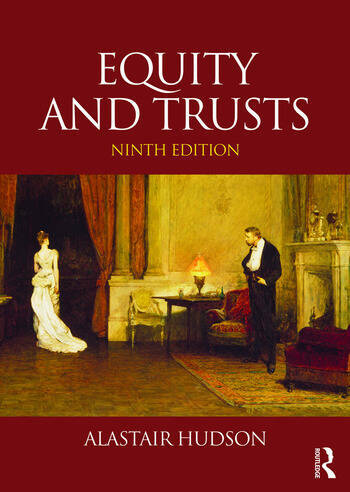 Equity and Trusts remains the most comprehensive and up-to-date coverage of the law of Equity and Trusts, while still a lively and thoughtful account of the issues raised by it. This book has been cited as being authoritative in the courts of numerous countries. • A host of other online materials and study guides new for 2016. ‘One of the book’s great strengths is its clear exposition of some very difficult areas of the law, moving seamlessly from points that puzzle students to points that puzzle practitioners. Other strengths are the breadth of its approach, the fact that it is extremely up to date, the freshness and vividness of its approach and its willingness to place equity in a wider context . . . The student will enjoy a clear, lively and challenging account of the subject matter. The practitioner will find the book well worth consulting for its clear exposition of the basic principles and of their application in difficult areas.’ – New Law Journal.